Sports and fitness is a growing field that encompasses a variety of positions. Depending on your specific interests, you will be able to do anything from managing professional sports teams to running a local gym or rehabilitation center. There are many online courses you can take that will earn you a certificate of completion if you want to be a personal trainer. If you’re looking to break into the field for professions such as athletic training, earning a bachelor’s degree can be a good starting point. However, some positions, such as sports administration, may require you to get a master’s degree. As a personal trainer, you’ll become accustomed to using both free weights and treadmills, along with all the other equipment and machines found in gyms and fitness centers. Clients will come to you at various fitness levels, each with very different goals. You’ll assess their needs and lifestyles and work up a plan that will help them achieve success. As the expert, you’ll provide instruction, direction, and advice to your clients during their workout sessions. You might create nutrition plans for them, as well. If you are considering becoming a personal trainer, there are some steps you must take. Choose which certification program best suits you. Choose your specialty: certified personal trainer or certified group trainer. Enroll in the certification program. These can be costly but some gyms will sponsor you to cover the cost. Study for, take, and pass the certification exam, which will allow you to work as a personal trainer. Train with a more experienced certified personal trainer. Find a job, or start taking on clients of your own! While not required, a degree in kinesiology, exercise physiology, or another exercise-related field can improve job opportunities. Finally, keep in mind that besides all your fitness knowledge, you need to have good communication skills in order to be a great personal trainer. You’ll need to fully understand clients’ goals and be comfortable explaining proper techniques so they avoid any injuries. Chances are, you won’t be working the typical 9-5 workday, since gyms have irregular hours. You might even flex your muscles in the face of a 40-hour work week: You’re there to help your clients reach their goals, no matter how long it takes. The median salary for personal trainers is $38K, but some make more than $72K. The job outlook for your career choice of personal trainer is 10 percent through 2026. This is faster than most other occupations—largely because more people are recognizing the health and wellness benefits of a proper exercise program and starting one themselves. Find athletic trainer programs near you. An athletic trainer is a health professional who works specifically with athletes to prevent and treat sports-related injuries. It’s your job to develop training programs to avoid further harm and recuperate the site, and you help determine when an athlete can return to the field. Athletic trainers are not qualified to perform the same tasks as doctors. However, they are certified to provide basic medical care. You must be able to assess injuries on sight, since you are usually the first healthcare provider at the scene. There are various types of athletic trainer careers you can specialize in, such as prevention, diagnosis, treatment, assessment, and rehabilitation. Get a bachelor’s degree in athletic training from an accredited school. To work for a university of professional athletic organization, you must get a master’s degree. Licensing requirements vary by state, but a license is mandatory in all 50. To be eligible for licensing, you must graduate from a program accredited by the Commission of Accreditation of Athletic Education. Pass the Board of Certification for Athletic Trainers (BOC). Take continuing education to keep your certification current. To do your job, you need to have social skills too; you will be constantly dealing with a variety of people. Being able to manage difficult situations while remaining organized is also important, as is having a strong desire to help people. As an athletic trainer, you can advance your pay and career by switching teams or sports, or becoming head athletic trainer/director. You could also go into a sales and marketing position—take what your knowledge and use it to sell medical and athletic equipment. Your median annual wage will be in the vicinity of $46K. Your specific figure will look different depending on where you work and how much experience you have. On a whole, the employment of athletic trainers is expected to grow 22 percent through 2026. This is much faster than most other occupations, and it’s due to people becoming more aware of sports-related injuries. Some schools are even requiring the employment of an athletic trainer because of the risk of concussions when kids play sports. In addition, there are even states acknowledging athletic trainers as medical providers and allowing insurance reimbursements. With a degree in sports management, quite a few different career paths on the business side of sports open up for you. You can become a sports agent, sports facility manager, or a public relations liaison. You can run a sports recreation facility or work with an athletic team: It’s all up to you based on what degree you get and where you take it. Not all schools offer a degree program specific to sports management. If that ends up being the case for you, look into a management, marketing, business administration, health, or accounting program. Any of those can be well suited for this field. Sports development: You will work to increase the number of people participating in a sport, using different means of marketing and communication in order to boost numbers. Sports facility management: You will manage a sporting venue, ranging from recreation centers to swimming facilities. Sports marketing: If you specialize in sports marketing, you will promote a particular event or sport through imaging, fundraising, social media, and other outlets. Associate: An associate degree should only take two years if you commit to it full time. That’s between 12-15 credit hours per semester. In the sports management industry, an associate degree is a stepping stone; your best option is to go onto a bachelor’s degree program. In your associate’s degree program, you’ll take classes like macro- and microeconomics, business law, sociology or psychology, and intro to business and sports management, plus your core classes and electives. Careers: An associate degree in sports management can get you entry level positions. You will be qualified for office work under a more experienced professional. Sports agencies, colleges and universities, and related associations will be where you find those entry level positions. Bachelor’s degree: Getting a bachelor’s degree is considered to be the best way to start strong in sports management. This four-year program will open up opportunities in public relations, marketing, sales, or finance, depending what segment of the major you choose to focus on. Just a note: Competition for job openings within this field is fierce, so you may want to consider continuing onto a master’s degree, just to get a leg up on your rivals. The classes you take will be more in depth than an associate degree, with courses like public relations practice and promotional writing, operations management, quantitative techniques, sport marketing, sport law, and sport society and ethics, along with your typical core classes. Careers: With a bachelor’s degree in sports management, you can a find job as a sports agent, within ticket sales, as an athletic director, and in business operations, just to name a few from the multitude of options you’ll have. Master’s degree: A master’s of science in sports management typically takes around two years and will give you an edge once you start your job search. You can choose a full or part time track, and there are also online programs available. Classes you may have include global sports, sport analytics, legal aspects, digital sport and media marketing, and socio-cultural dimensions of sports. You will also have an internship, as well. Careers: With a master’s of science in sports management, you can enter careers such as an athletic director, a marketing manager or director, a development director, or a team owner. Salaries for people in the sports management field vary depending on what position they hold, state they live in, and industry they work in. Distance learning programs are a combination of self-study and instructor-led courses that allow you to complete the classes at your own pace and in the comfort of your own home. Within a virtual classroom, students complete reading assignments, view lectures, and participate in class discussions. 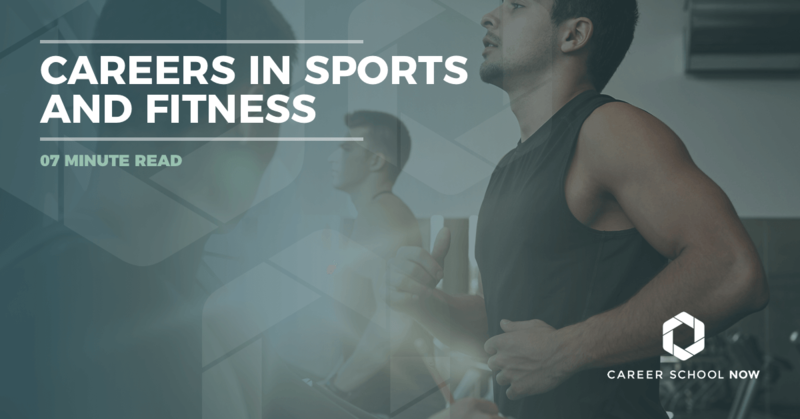 Online bachelor’s and master’s degree programs in sports and fitness areas are now offered by many four-year universities and colleges. Some programs are conducted entirely online, though others may have some onsite requirements. Depending on your degree program, practicum experience or internships may be required.